As a service to developers, planning commissions, local health departments and other local governmental units, the Utah Department of Environmental Quality (hereafter referred to as the Department) will review proposed developments with respect to the feasibility of water supply and wastewater disposal. Requests for these feasibility reviews must be initiated by the local health department having jurisdiction of the area where the project will be constructed. A common error in the development of housing, commercial or industrial projects is a lack of advance investigation of the site, with subsequent discovery that delivery of water and disposal of wastes are not feasible. This inevitably gives rise to health hazards which are correctable only at unreasonable cost or by imposing intolerable inconveniences. Thus, the feasibility review may avert hardship for both the developer and the public-at-large. Note that this feasibility review in not required by Department administrative rules, although it may be required by local laws or policies. Other reviews are required by Department rules and they are described herein as well as in the Utah Administrative Code. Certain basic information must be submitted to the Department in order for a feasibility review to be conducted. A narrative report addressing the short-range and long-range water supply and wastewater disposal facilities proposed to serve the development must be submitted. A project will be deemed feasible only when all needed information is submitted and found to be acceptable. A 30-day review period should be assumed. A longer review period may be necessary if incomplete or unsatisfactory information is submitted. Copies of all necessary information must also be sent to the local health department in the area where the project will be constructed. The reviews of the feasibility of water supply and wastewater disposal are made jointly. That is, a water supply may be considered feasible only if the wastewater disposal facilities are also feasible. Likewise, wastewater disposal facilities may be considered feasible only if water supply facilities are also considered feasible. After review of all information, plans, and proposals, the Department will send a letter to the individual who submitted the feasibility report and to the local health department and planning commission involved, stating the results of the review. Statements of feasibility are considered valid for a period of one year. 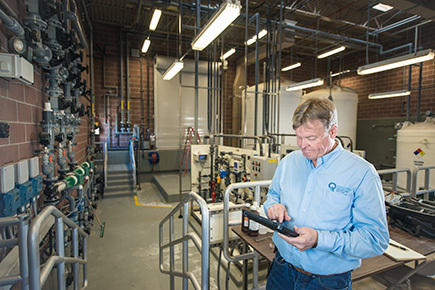 A public water system is defined as one, either publicly or privately owned, providing water for human consumption and other domestic uses to 15 or more service connections or 25 or more people at least 60 days out of the year. Water supply information will be evaluated with respect to Section R449-101 through R449-112 of the Utah Administrative Code (UAC), which should be consulted. The Division of Drinking Water also publishes the same sections as a two-part publication titled; “Utah Public Drinking Water Rules”. If an existing public water system, not controlled by the developer, is to furnish water for the proposed development, a letter must be furnished by those in responsible charge of the system stating that the development can be served adequately under existing conditions and for a reasonable future time. The minimum working water pressure expected at the point of connection between the existing and new distribution lines must also be stated. This letter will be reviewed in light of Division of Drinking Water file information relating to the adequacy of the existing system and additional information on file is considered insufficient or outdated. Evidence of water rights or ownership of proposed sources of supply. The water rights must be sufficient to meet the anticipated yearly demand and peak day demand of the system. Refer to Section R449-105 of the UAC for information on determining yearly demand and peak day demand. The number and type of connections anticipated. If culinary water will be used for the irrigation of lawns and gardens, a statement of the number of acres to be irrigated must be provided. Type of institution which will be created to own and operate the system. If the institution is intended to be profit-making, the status of action to establish Utah Public Service Commission supervision must be provided, if not, an exemption must be obtained from the Commission.Where the proposed water sources vary in yield (e.g., springs, streams), a history of water flow from the sources must be presented. The history must indicate expected minimum and maximum flows and when they will occur. A complete chemical analysis covering each source of water proposed for use. The analysis must be performed by a laboratory certified for the chemical analysis of drinking water. Samples must be collected in specially prepared bottles available from the Department or from any certified laboratory. The chemical quality of all sources must meet the requirements of Section R449-103 of the UAC. Evidence that springs and wells proposed as water sources can be adequately isolated from all present or potential sources of pollution. Refer to Section R44-106 of the UAC for information in this regard. The protection area required for a well is based upon an evaluation of its “Report of Well Driller”, a copy of which must be submitted for review. If an existing public water system controlled by the developer will be expanded to serve the proposed project, the information specified in item 2, A through F above, must be submitted for review. Information which is already on file with the Department need not be submitted, however. If individual wells are proposed as sources of supply for each subdivision lot, or if non-public water supply wells are proposed to serve several lots, a statement from the Utah State Engineer’s Office (or the regional office having jurisdiction) must be submitted indicating the feasibility of obtaining groundwater suitable in quantity and quality to serve the proposed residences throughout the subdivision area. Evidence of water rights or ownership of such sources must also be submitted, including the State Engineer’s application number. In this case, subdivision lots must be large enough to permit separation of the water supply source from present or potential sources of pollution as required by the local health department having jurisdiction. In the event the adequacy of the underground aquifer cannot be addressed by the State Engineer’s Office, a representative number of wells, depending on subdivision acreage and lot size, must be drilled on the property and the quantity and quality of the water in each well tested and found satisfactory before a statement of feasibility for such wells to serve the entire subdivision is issued. Information from existing wells in reasonable proximity to the project may be considered. If individual wells are found to be feasible, each well must be constructed in accordance with local health department requirements, or with best public health practices, and isolated from concentrated sources of pollution as required by the local health department. If individual or non-public springs are proposed as sources of supply for single or several subdivision lots, the quantity, quality, and legal right for each source must be determined and proven in the same manner as required for public water systems, and the information must be submitted for review. Subdivision lots must be large enough to permit required separation of culinary springs from present and potential sources of pollution. Spring sources must be developed in accordance with local health department requirements, or with best public health practices, and isolated from present and potential sources of pollution as required by the local health department having jurisdiction. Note that if a single spring source supplies water for human consumption to 25 or more individuals at least 60 days out of the year, the devices for storage and distribution as well as the spring will be considered a “public water system” and must comply with Department rules. The Department’s Rules For Individual Wastewater Disposal Systems addresses minimum lot sizes for single-family residences utilizing individual wastewater disposal systems and specifies the minimum distance that the components of such systems shall be separated from non-public water supply sources. If a new public wastewater treatment and disposal system is to be provided, an engineer’s report must be submitted outlining the principal features of the proposed system, including treatment methods and final effluent disposal conditions, as well as the type of institution which will be created to own and operate the system. A plat of the subdivision or development must be submitted for review and shall be drawn to such scale as needed to show essential features. Ground surface contours must be included, preferably at 2-foot intervals unless smaller intervals are necessary to describe existing surface conditions. Intervals larger than two feet may be authorized on a case-by-case basis where it can be shown that they are adequate to describe all necessary terrain features. The plat must be specifically located with respect to the public land survey of Utah. A vicinity location map shall be provided with the plat for easy location of the subdivision area. 1. Name and location of proposed plat. 2. Name and address of the developer of the proposed project and the engineer or individual who submitted the feasibility report. 3. Statement of intended use of proposed plat, such as residential single-family, multi-residential, commercial, industrial, or agricultural. 4. The proposed street and lot layout, the size and dimensions of each lot and the location of all water lines and easements, and if possible, the areas proposed for sewage disposal. All lots shall be consecutively numbered or lettered. For individual wastewater disposal systems, the minimum lot size shall be sufficient to permit the safe and effective use of such systems and shall comply with requirements in the Rules For Individual Wastewater Disposal Systems. Replacement area for absorption systems on each lot shall also comply with the requirements of that regulation. Plats used for multi-residential and industrial purposes will require a study of anticipated sewage flows prior to developing suitable area requirements for sewage disposal. 5. Ground surface slope of areas proposed for individual wastewater disposal systems shall comply with requirements in the Rules For Individual Wastewater Disposal Systems. 6. The location, type and depth of all existing and proposed non-public water supply sources within 200 feet of individual wastewater disposal systems, and all existing and proposed public water supply sources within 1,500 feet of individual wastewater disposal systems. 7. The locations of all rivers, streams, creeks, washes (dry or ephemeral), lakes, canals, marshes, subsurface drains, natural storm water drains, lagoons, artificial impoundments, either existing or proposed, within an adjacent to the area to be platted, and cutting or filling of lots that will affect building sites. Areas proposed for subsurface wastewater disposal systems shall be isolated from pertinent ground features as specified in applicable rules. 8. Surface drainage systems shall be included on the plat, as naturally occurring, and as altered by roadways or any drainage, grading or improvement, installed or proposed by the developer. The details of the surface drainage system shall show that the surface drainage structures, whether ditches, pipes, or culverts, will be adequate to handle all surface drainage so that it in no way will affect subsurface wastewater disposal systems on the property. Details shall also be provided for the final disposal of surface run-off from the property. 9. If any part of a subdivision lies within or abuts a flood plain area, the flood plain shall be shown within a contour line and shall be clearly labeled on the plat with the words “flood plain area”. 10. All soil exploration pits and percolation test holes shall be located on the subdivision plat and identified by a key number or letter designation. All soil tests shall be conducted at the owner’s expense. 11. A report by an engineer, geologist, or any other person qualified by training and experience to prepare such reports must be submitted to show a comprehensive log of soil conditions throughout the project area. A sufficient number of soil exploration pits shall be dug on the property to provide an accurate description of subsurface soil conditions.Soil descriptions should conform with the United Soil Classification System. Soil exploration pits shall be of sufficient size to permit visual inspection (preferably dug with a backhoe), and to a minimum depth of 10 feet, and at least 4 feet below the bottom of proposed absorption systems. One end of each pit should be sloped gently to permit easy entry if necessary. Deeper exploration pits are required if deep absorption systems, such as seepage trenches, are proposed. For each soil exploration pit, a log of the formations encountered must be submitted for review which describes the texture, structure, and depth of each soil type, the depth of the present ground water table if encountered, and any indications of the maximum ground water table. Soil exploration pits shall be made at the approximate rate of 1 test per 3 acres or 1 test per 2 lots if lots are larger than 3 acres. If soil conditions and surface topography indicate a greater or lesser number of soil, exploration pits may be required by the Department or local health department. Whenever available, information from published soil studies of the area of the proposed subdivision should be submitted for review. Soil exploration pits must be conducted as closely as possible to the sites on the lots or parcels proposed for absorption systems, and shall be distributed as uniformly as possible over the property such that no significant areas remain untested. The Department or the local health department shall have the option of inspecting the open soil exploration pits. Complete results shall be submitted for review, including all unacceptable test results. Absorption systems are not permitted in areas where the soil requirements of applicable rules cannot be met. Where soil and other site conditions are clearly unsuitable, there is no need for conducting soil exploration pits. 12. A statement by an engineer, geologist, or any other person qualified by training and experience to prepare such statements, must be submitted indicating the present and maximum ground water table throughout the project. If there is evidence that the ground water table will rise to less than 2 feet from the bottom of proposed absorption systems, or to less than 4 feet from finished grade, conventional subsurface absorption systems will not be approved. Ground water table determinations must be made as specified by applicable rules. 13. An adequate number of percolation tests shall be conducted on the property to determine the permeability of the soils for absorption systems. All percolation tests shall be conducted in accordance with procedures specified in applicable rules. Such tests shall be made at the approximate rate of 1 test per 3 acres or 1 test per 2 lots if lots are larger than 3 acres. If soil conditions and surface topography indicate a greater or lesser number of percolation, tests may be required by the Department or local health department. Percolation tests must be performed as closely as possible to the sites on the lots or parcels proposed for absorption systems, and shall be distributed as uniformly as possible over the property such that no significant areas remain untested. Where questionable soil conditions exist, the Department of local health department shall have the option of monitoring the percolation test procedure. Complete results shall be submitted for review, including all unacceptable test results. Absorption systems are not permitted in areas where the soil percolation rate is slower than 60 minutes per inch or faster than 1 minute per inch. Where soil and other site conditions are clearly unsuitable, there is no need for conducting percolation tests. All critical dimensions and distances for the selected lot(s), including the distance of the subsurface wastewater disposal system from lakes, ponds, watercourses, etc. Location of dwelling, with distances from street and property lines. Location of culinary water lines, water supply source, subsurface wastewater disposal system, property lines, and lot easements. Capacity of septic tank and dimensions and cross-section of subsurface absorption system. Results and locations of individual soil exploration pits and percolation tests conducted on the selected lot(s). If individual wells or springs are to be provided, the plat shall show typical lot layouts, indicating the relative location of the buildings, wells or springs, and subsurface absorption systems. 15. Multiple units under individual ownership, except condominiums and twin homes, shall not be served by a common subsurface wastewater disposal system except where that system is under the sponsorship of a body politic. Plans and specifications shall conform to requirements for such systems and shall be submitted to the Water Quality Board for review. Issuance of a construction permit by the Board shall constitute approval of plans and authorization for construction. 16. If proposed projects are located in aquifer recharge areas or areas of other particular geologic concern, the Department or the local health department may require such additional information relative to ground water movement, or possible subsurface sewage flow as may be necessary to determine that adequate protection against contamination of any existing or proposed water supply source will be provided, and that no pollution of the waters of the state will occur. 17. An affirmative statement of feasibility for a subdivision proposing individual wastewater disposal systems does not imply that it will be possible to install individual wastewater disposal systems on all of the proposed lots, but shall mean that such disposal systems may be installed on the majority of the proposed lots in accordance with minimum state requirements and any reasonable conditions that may be imposed.